Eventide loaded the Eventide DSP7000 Ultra-®Harmonizer with features that put it in a class by itself. The variety and depth of its programs are truly amazing, from lush reverbs, to choruses, to flanges, to delays, to pitch shifters, to dynamics, to EQs, to filters, to distortions, to synthesizers, to samplers, to ring modulators, and to everything in-between. Most frequency and time-dependent parameters (e.g. delays, LFO’s) synchronize to a system tempo for ease of use. And if that’s not enough, the DSP7500 boasts nearly three minutes of sample time in addition to the 40 seconds of delay time! And for the user who is interested in making his or her own programs (if the huge number of factory programs aren’t enough! 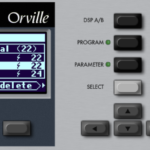 ), the DSP7000 family continues the “modular programming paradigm” that made the DSP4000 famous. 500 factory presets, from ripe reverbs to incredibly accurate, top-quality pitch change programs, let you take full advantage of the DSP7000’s amazing effects processing. 150 presets can be stored internally, while hundreds of further presets can be stored on removable PCMCIA cards.